Editors’ Note: The following was released by the Alliance of Carolinians Together (ACT) Against Coal Ash in response to Duke Energy’s plan to provide alternate drinking water sources to resident with contaminated well water living near coal ash sites. 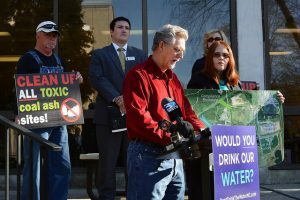 The plan includes a $5,000 “goodwill payment” for families with contaminated wells, but only for those who sign a waiver saying they won’t sue Duke Energy in the future. 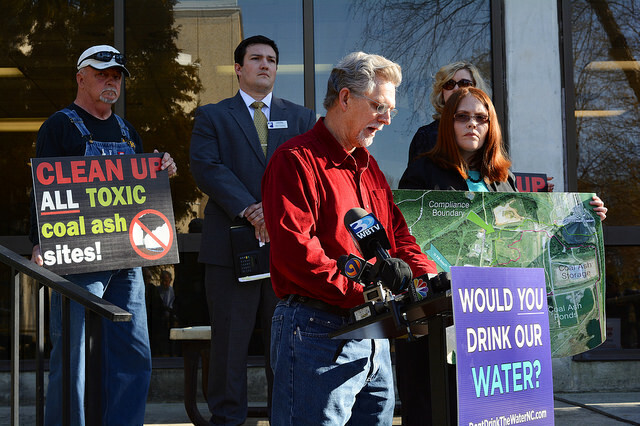 Citizens rally in N.C. to call for clean-up of toxic coal ash pits across the state. On Friday the 13th, Duke Energy released a “goodwill” offer to residents on wells near the company’s coal ash sites. To many residents, however, the ominously timed release is more hush money than it is an act of goodwill. According to what residents have read in the media, Duke’s offer comes with conditions: in exchange for the money, residents must forgo their right to sue Duke over groundwater contamination in the future. Duke wants to cap the remaining coal ash pits in place, a method that is less expensive but does not prevent continued damage to nearby groundwater and health. The company is doing everything it can to lock that option into place. Capping in place the remaining sites would leave nearly 70 percent of the ash where it is — in some places, that means leaving it sitting in the groundwater table. Residents are concerned that the coal ash left in the ground will continue to leak and present a serious health risk to the general public, leading to more expenses down the line that Duke Energy’s offer doesn’t begin to cover. Meanwhile, coal ash is in demand from the North Carolina concrete industry. Reprocessing coal ash into concrete is a promising technology. But without cooperation from Duke Energy to reprocess ash from the state’s largest coal ash dumps, the industry is forced to import ash from India and China. Duke’s goodwill package also provides for Duke making up the difference in fair market value if homeowners are forced to sell below value to due the stigma of contamination. “Who would want to buy here now anyway, what will they do if we simply cannot sell? Will they buy our homes? What happens then?” asks Kenya Morgan of Dukeville, near the Buck Steam station.